As a promoter for one of Irelands clubbing success story's (Escape @ Liquid), Spencer was always going to have his ear to the ground when it comes to recognising quality music as he proved last year with his debut release on Discover Dark "Spark Plug". 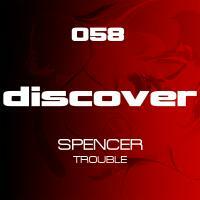 With "Trouble", Spencer still keeps it nice and tough with a driving bassline and plenty of stabs to keep you on your toes. He also adds the type of cool understated melody that we love at Discover and that makes this track perfect for the label. 'Trouble' is available now from Beatport and iTunes.